Wick Road used to have terraced housing along the entire length of the road until it was almost entirely demolished in the late 1960's to build the A102(M) at the very eastern end with all the terraced housing west of Cassland Road replaced by blocks of flats. It was also turned into a wide one way road in order to ferry as much motor traffic away from what was then a motorway in the quickest time possible. Needless to say this makes it an unpleasant road to travel on using any form of transport. As part of their commitment to remove the Victoria Park one way system Hackney council are currently consulting on spending £700,000 on turning Wick Road back to a two way road. 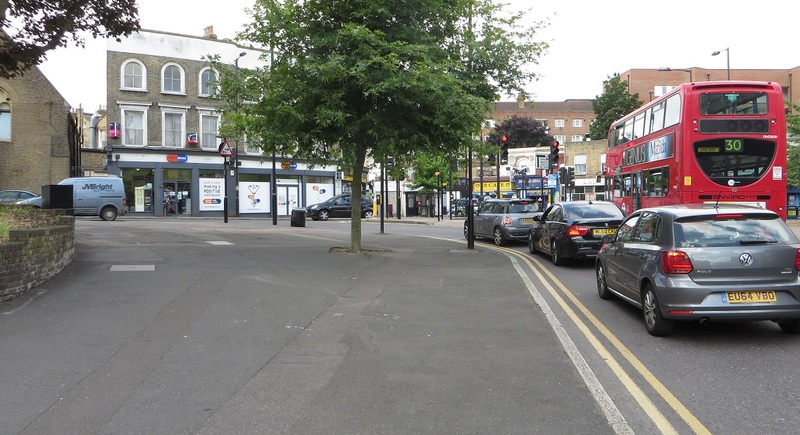 This is a great opportunity to create conditions on this road where children feel safe enough to cycle to school, where elderly residents cycle to the shops, or to quote Hackney Council's 2014-2024 cycling plan "A place where it is second nature for everyone, no matter what their age, background or ethnicity to cycle". Being a very local resident and someone who travels along Wick Road often I thought I would look at the consultation in more detail. Both eastbound and westbound lanes of Wick Road are to be moved onto the area of pavement to the left of the current road here. 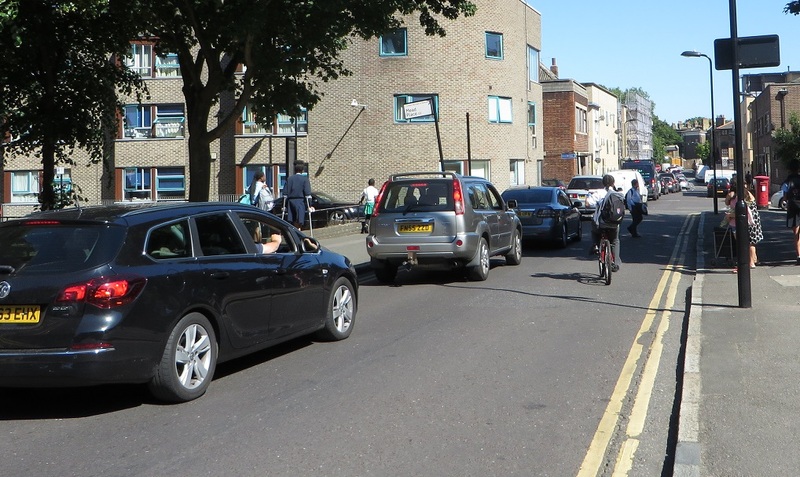 No cycle lanes and no ASL means people cycling will be stuck behind a queue of traffic at the traffic lights; Currently that queue can easily extend the whole length of Wick Road during the morning peak. Can you seriously see "anyone, no matter what their age" cycling along here where they have to queue up at the lights sandwiched between lorries and buses? It is senseless to devote such a large amount of space to a pointlessly large pavement that no one is going to use. 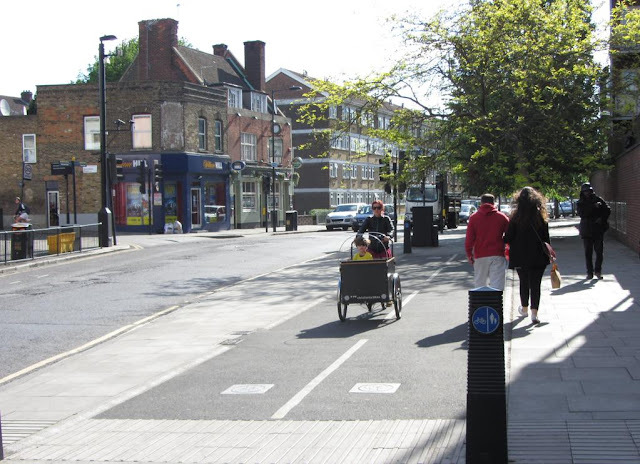 This is something that Hackney Council seem very keen on in recent road schemes; "improved public realm" they call it; whereas in reality it is just a waste of space (and probably leads to more cycling on the pavement). I'm not against creating more space for people walking and it is obviously beneficial when it is implemented in areas with large numbers of pedestrians but Wick Road is not the place for it, especially when such poor conditions remain for people cycling on the road alongside. 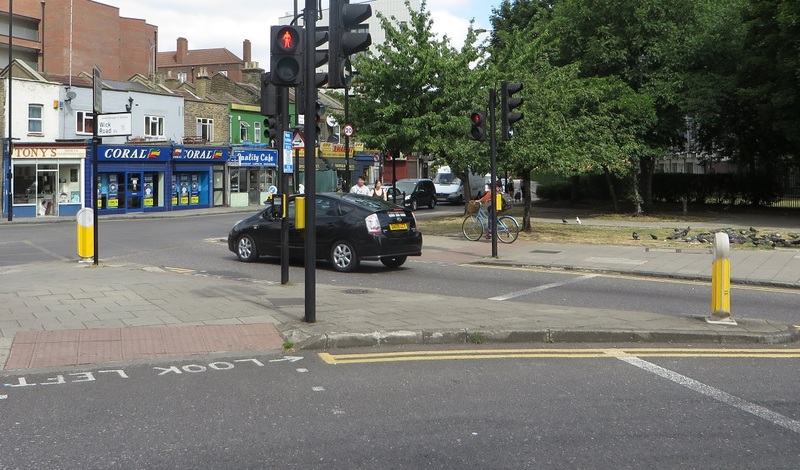 This space would be much better used to build protected cycle infrastructure at this junction in order to keep people on bikes separate from left turning vehicles (especially lorries) whilst also creating a handy "red light bypass" for people cycling. Literally an improved version of the cycle tracks that existed at the other end of this very road before the council removed them in 2012. 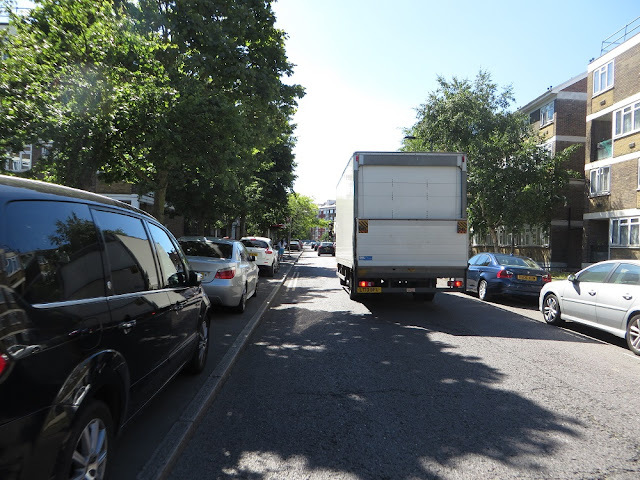 You may also have noticed in the plans above how despite Hackney's supposed opposition to one way streets that within this consultation Well Street is to remain a one way street, in order to preserve car parking on both sides of the road. Well Street used to have a thriving market and a certain Jack Cohen was one of the stallholders nearly a century ago until he left his pitch to open a shop; he named it Tesco. These days there is barely a market left here at all having ironically been killed off by the Tesco store located on it. It is sad to see this market dying whilst other markets in the borough, such as Broadway Market and Chatsworth Road, are both flourishing and expanding. Well Street could be closed to traffic which would no doubt help to return it to a bustling street market, perhaps with Broadway Market style restaurants and bars with pavement tables (although ideally without the cars speeding on the pavement, but more on that another day). If the council were to build cycle tracks along Wick Road linking Well Street to Hackney Wick and Homerton then perhaps families would feel safe enough to cycle to Well Street for a bit of market shopping rather than park their car on it to nip into Tesco instead. It could be a very different street to the one way car park surrounded by takeaways, launderettes and derelict pubs that it is now. I'm not really for or against one way streets. I do believe that large multi-lane gyratories such as Stoke Newington do not belong in a city such as London and I support turning them back into two way roads but not if they are just replaced with nasty multi lane roads going in both directions, as has occurred in Shoreditch, Tottenham and Brixton. I also believe, unlike the Hackney cycling campaign, that one way streets (with two-way for people cycling and walking) are needed in our cities as a way to discourage through motor traffic, something which is pretty standard in Dutch cities. Camden Council are about to embark on a fantastic scheme; they're going to turn Tavistock Place from a two way road to one way for motor traffic. What was the westbound traffic lane will then become a cycle track, with the current hugely popular but narrow and overcrowded two-way cycle track on the northern side of the street becoming a one way track, doubling the capacity for cycling. Also because of the way the one way system is laid out it will discourage through traffic and should therefore lead to more pleasant conditions for pedestrians in the area as well. Hackney Council take note! The very wide western end of Wick Road, probably enough space to fit a motorway in here. No real changes to the layout planned here except money is to be spent converting the parking on the pavement to the left into proper inset parking bays. Note the amount of space the father and his son are taking up cycling on the pavement, there is easily enough room for a cycle track with plenty of room left for people walking too. 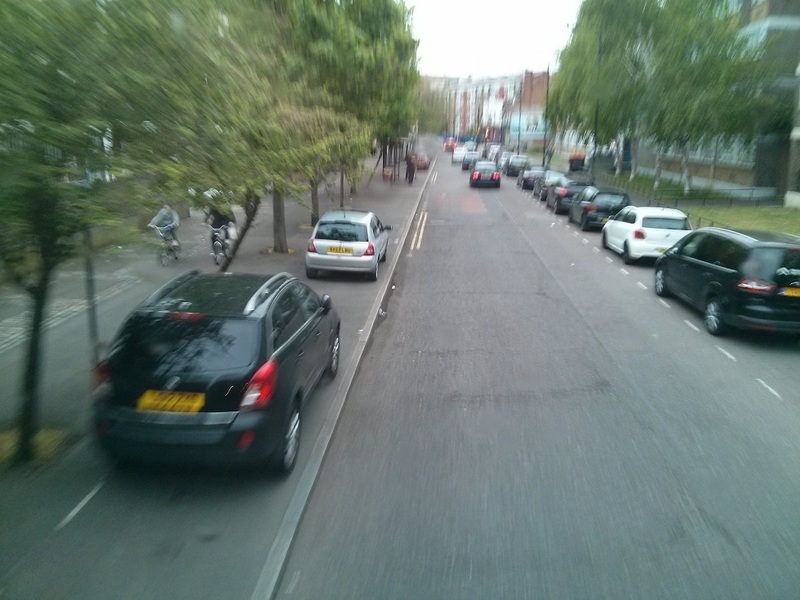 The parking could remain and form a barrier for a cycle track where the trees currently are. There is clearly enough room here for all. As for bus users the proposed changes may be better if you live on or North of Wick Road and want to alight on the number 30 as it'll drop you off 200 metres closer to home. However should you live south of Cassland Road then it'll mean a slightly longer walk home from the bus stop. Either way this does very little to change things for bus users in the area. When the A12 gets clogged up you'll still be stuck in traffic and it'll take an age to move several miles through Hackney, just like now. 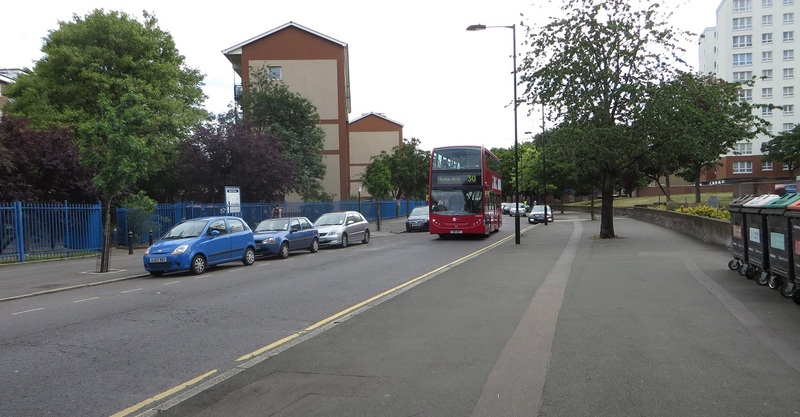 Not all of Wick Road is one way; the Eastern section of it is a two way dual carriageway which links the A12 to the one way section of Wick Road, Homerton High Street or Victoria Park Road. Here is some old footage from Thames News from 1984 illustrating that this section of Wick Road has barely changed in over 30 years. What was once a pleasant riverbank must now be one of the worst roads in the borough for people on foot or bike, where you have to cross motorway style slip roads along both sides of the road. I try to avoid it as much as possible despite living on one of the roads that connects to it. The most recent traffic count carried out here revealed that less the 1% of vehicles here are bicycles. A very unpleasant two way road. The council need to decide what kind of road Wick Road is going to be. If, as this consultation implies, they want it to be a main road taking through traffic to and from the A12 to Hackney Central or onto Islington and beyond, along with being one of the main bus routes for services to the East of the borough with double decker buses passing through every couple of minutes then it needs protected cycle tracks. If it is going to be a quiet residential road where traffic tootles along at 20mph, pedestrians cross the road at will and people of any age and ability mix it with traffic whilst cycling then it needs through traffic removed, buses re routed elsewhere and some traffic calming measures. Rachel Aldred has written about this cycle track here so little point in me repeating what she says. 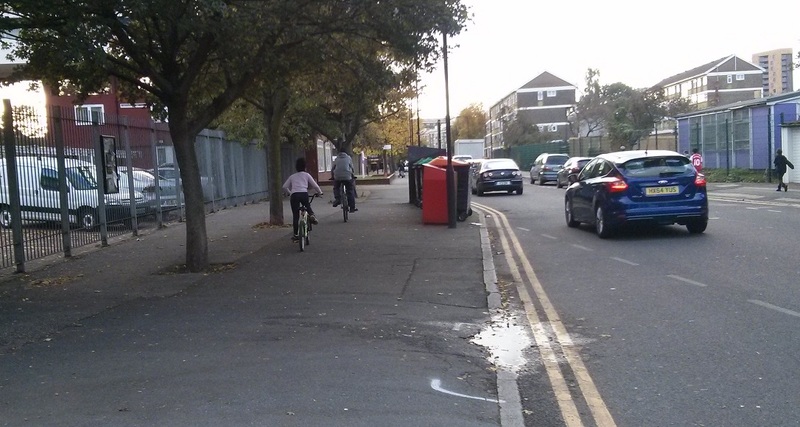 Hackney Councillor Vincent Stops claims that “The cycle lane on the pavement was installed to facilitate two-way cycling and so now becomes redundant for most cyclists.” which is true if accounting for people who currently cycle in Hackney who are, on the whole, a small minority of the population and mostly young men. You'll need the highest level of 'bikeability' training to travel along here on a bike . A two-way Wick Road with no cycle tracks means only the kind of people who currently cycle on the main roads will be willing to use it should this consultation go ahead with virtually no children cycling along here at all. To quote the Hackney cycling plan we need "safe and comfortable routes for experienced and less experienced cyclists alike" and "in order to increase the borough's cycling levels the borough will need to target currently non-cycling residents that view cycling to be less appealing than other modes of transport." Hackney council need to be much more ambitious if they are to more than double the rates of cycling in the borough by 2024. 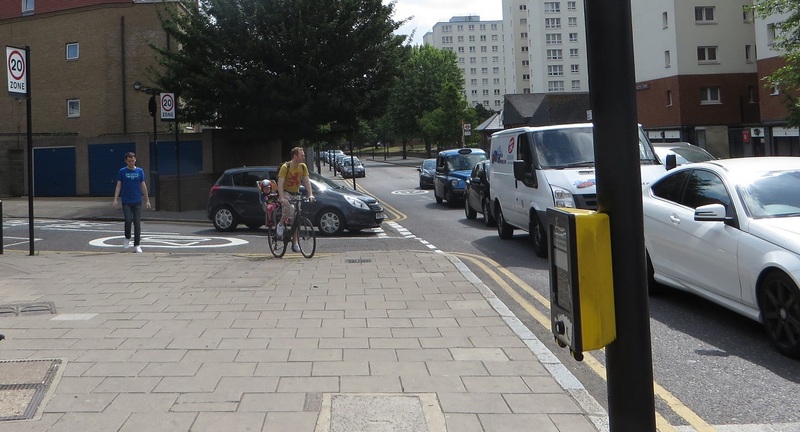 Hackney Council have a poor history when it comes to listening to residents views on their consultations; for example only providing cycle training when people have asked for safer conditions for cycling on the boroughs roads. 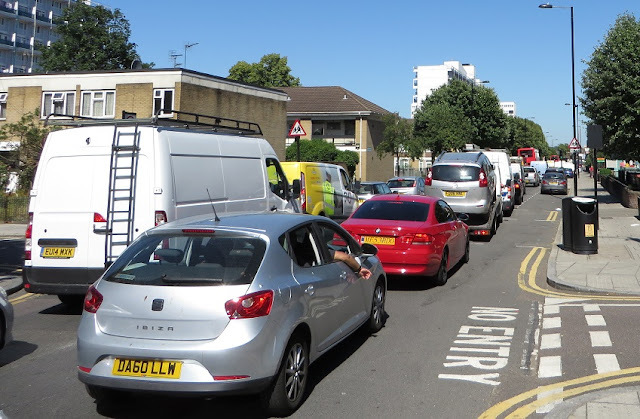 Recently Feryal Demirci was "delighted by the outpouring of support for the route" of CS1 despite the consultation stating that 41 people commented on the route with 95% of them, including The London Cycling Campaign and Hackney People on bikes, not supporting the route. Only the London branch of the Cyclists' Touring Club and the Licensed Taxi Drivers Association supported CS1 being diverted away from the A10, with the Taxi Association saying that the route would have "a lower impact on general traffic"
As Rachel Aldred points out it is worrying that such an extensive scheme has got to this stage with little consultation. Residents are given no options to choose from, just this one design and asked to vote yes or no. There is a severe lack of supporting documents; how much busier will Wick Road be under these plans? 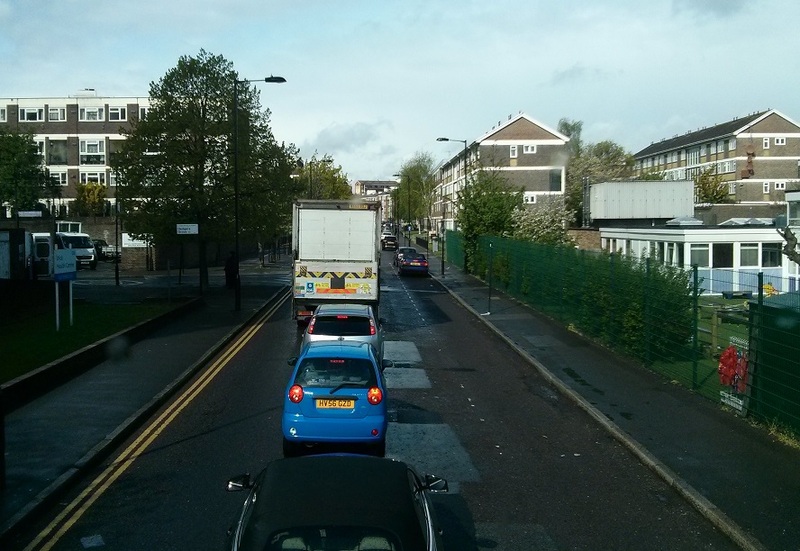 How many buses and lorries are expected to travel along here per day? What will the impact be on air quality in an area already blighted by very high usage of motor vehicles? What are they going to do to tackle rat running on roads surrounding Wick Road? The council claimed in the cycling plan that they are "open and willing to examine proposals for segregated and semi‐ segregated cycle lanes on principal roads" yet we're not given this option despite the layout of Wick Road. 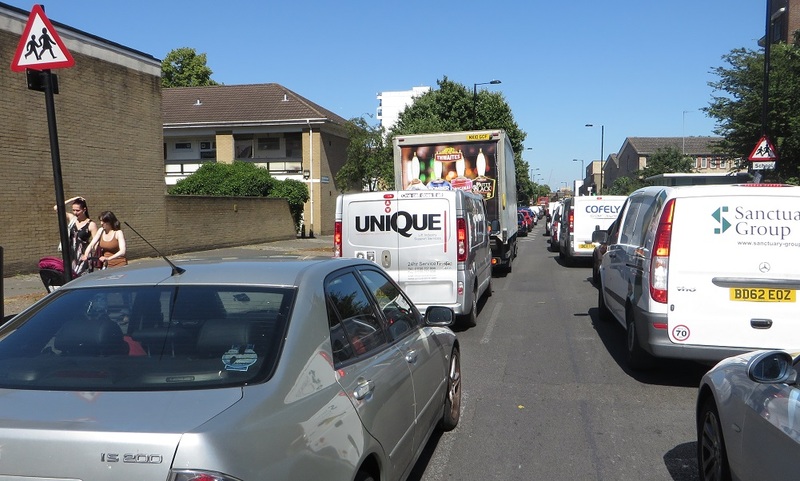 If Hackney Council won't build protected cycle tracks here on a wide road in a deprived area containing a high volume of traffic yet with only a couple of side roads and somewhere where hardly any on street activity takes place then I'm not convinced they'll build them anywhere. How is opening up a road that leads to a former motorway to motor traffic in both directions going to help active travel within Hackney? It is a shame that any criticism I make of cycling provision in Hackney is often followed by claims of "Hackney bashing". 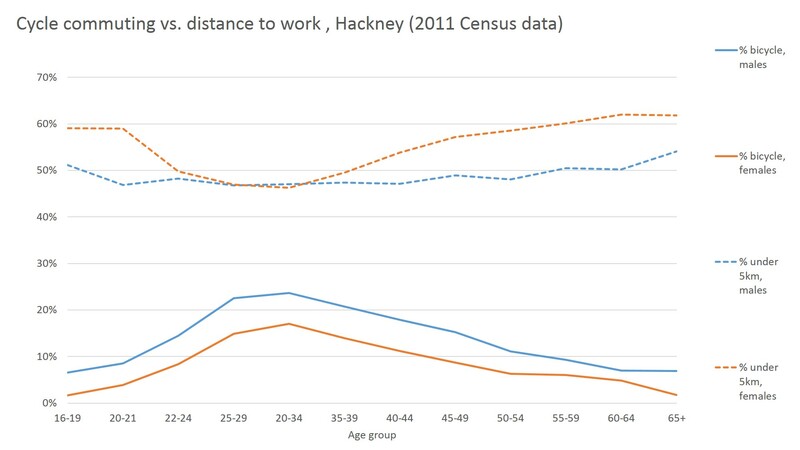 However the statistics are quite clear: 7% of all journeys in Hackney are by bike with three times that amount (21%) by car, almost as many trips as by bus (23%). For children cycling to school the figure is just 2% and has not seen any significant increase for many years yet more than one in ten children travel to school in Hackney by car. Why are more than one in five journeys in Hackney by car when 65% of households are car free? Why is Hackney's mode share of trips by private motor car 21% yet in the nearby boroughs of Camden and Islington it is 15% and 18% in Tower Hamlets? 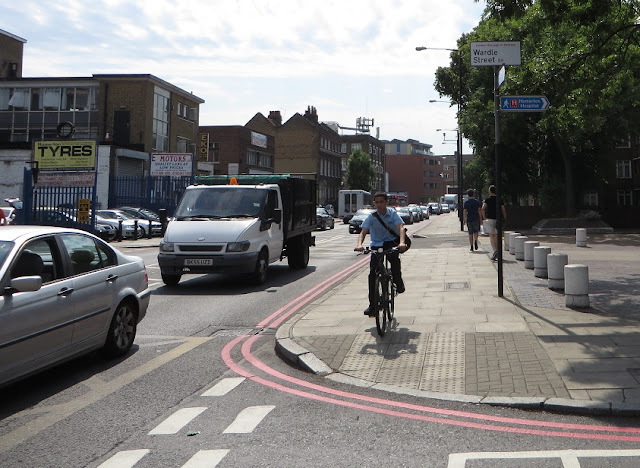 Hackney still has the highest levels of cycling for people who commute to work and it does some things very well, in particular making some residential roads safe, comfortable and attractive for cycling by filtering out motor traffic. However other boroughs are about to embark on some truly fantastic schemes and radical plans from Waltham Forest Council will make cycling on the main roads in Hackney seem horrendous compared to our neighbours. 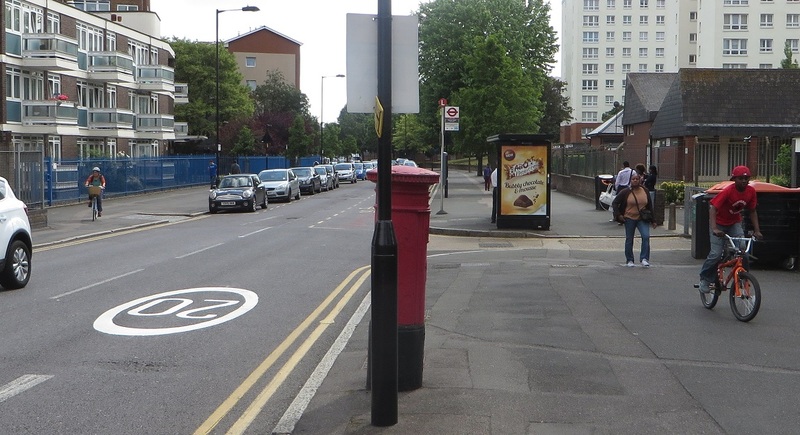 The Lea Bridge Road cycle tracks will revolutionize cycling to the East of the borough but will embarrassingly more than likely to give up as soon as you cross the border into Hackney. 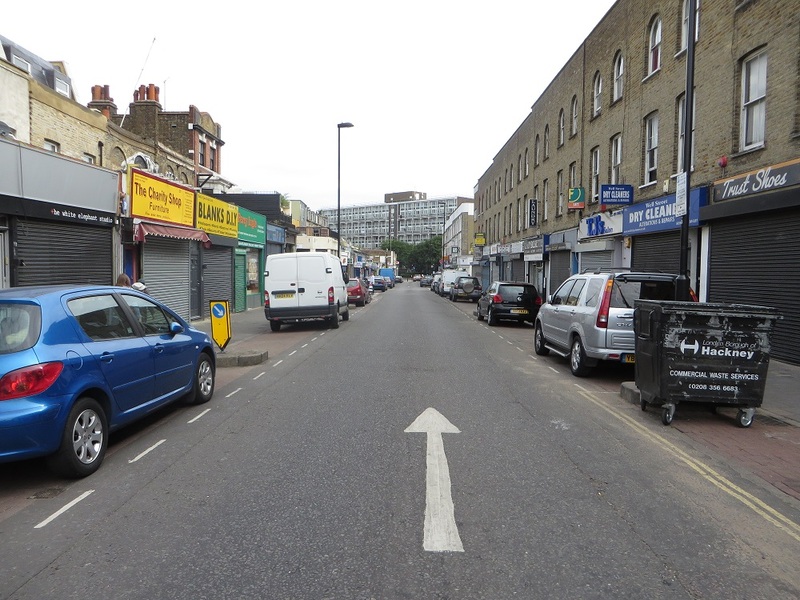 I'm not suggesting that Hackney Council does not make Wick Road two-way but this design needs to be rejected with the plans for Wick Road taken back to the drawing board. We need to be more ambitious and should not be spending £700,000 creating even more routes for motor traffic to use whilst also removing well used, dedicated safe space for cycling. Rather than Wick Road remaining a busy and hostile road we need to consider other options and trial other ideas to create a road where it is safe and inviting for all road users and benefits local residents. A scheme which is as bold and progressive as the plans and visions coming from some of the other London boroughs. The consultation is open until Friday 10th July. Please respond here and feel free to borrow any of what I have written, if you agree.